The December meeting of the World Council on International Telecommunications (WCIT 12) ended in a state of disarray that was portrayed in mainstream western media as a blow to future international agreement on internet governance. For example, The Guardian published an article headlined "Dark clouds remain over the future of internet governance." 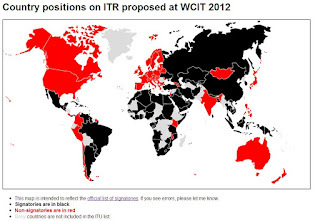 However, as Professor Milton Mueller of Syracuse university pointed out in a blog post on the Internet Governance site, WCIT 12 may have been derailed more because of what he calls "ITU phobia" than for substantive reasons actually affecting governance and the operation of the internet. It is well known that China, Russia and certain other countries in the Asia-Pacific region would like to see governments in control of the internet. The map to the left, published along with the article in The Guardian, shows the breakdown of votes. (click to see a full-size version) However, it is worth questioning why South Korea voted for the treaty while Japan, India, the Philippines, Australia, and New Zealand did not. Perceptions are important, and many observers might have expected that the nation with the world's most advanced and extensive broadband networks would have voted the other way, simply to avoid any confusion about whether it favors a free and open internet.